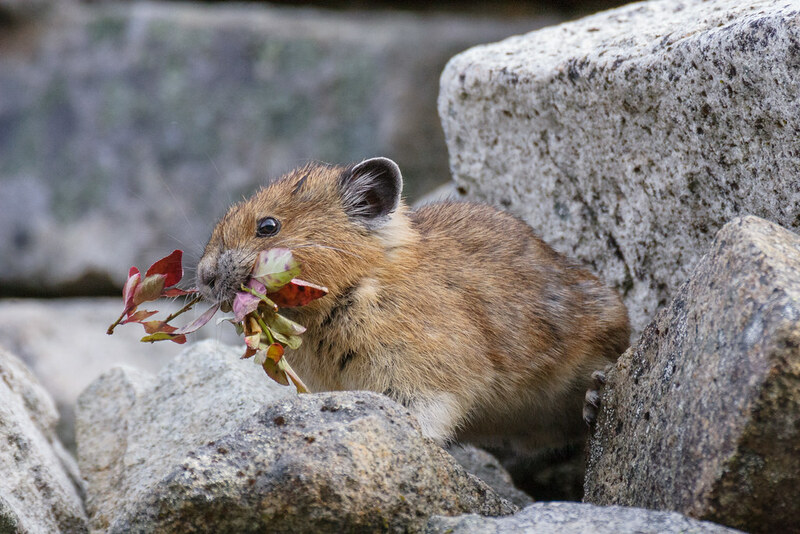 This is the same pika that I denied a taste of my mango, as you can see it was quite adept at finding food on its own. 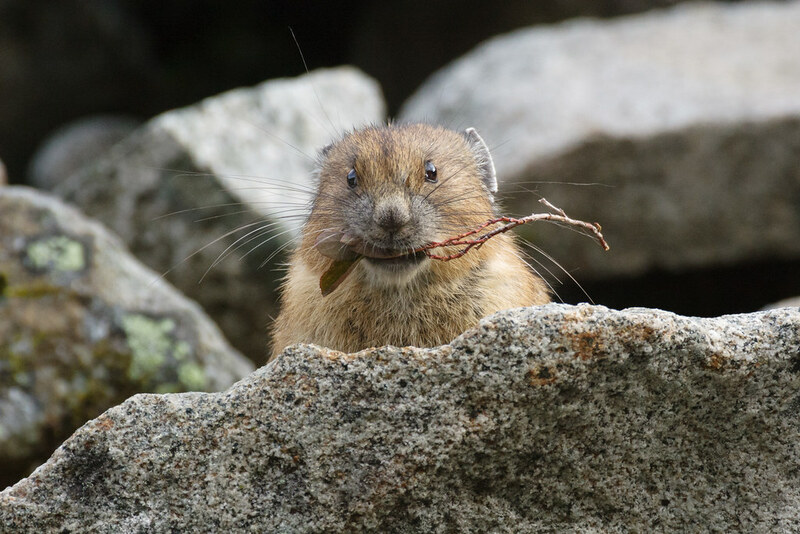 It had just sprinted across the talus field with these twigs in its mouth, it paused for a moment and straddled these rocks before disappearing below to add to its winter store. A hoary marmot at the end of Mount Rainier’s Summerland Trail eeks out the last bit of warmth from this sunlit rock before the mountains blocked the sun and threw its perch into shadow. I’ve been taking a hiking trip each fall, in Wyoming this meant that not only did I miss the summer crowds, but also got fall colors and the elk rut. But it also meant the weather can be hit and miss, such as last year when a snowstorm forced me to cut my trip short. My fear when I started my Washington trip was that I had waited one week too long. After nice sunny weather the previous week, the rain arrived heavily on the first day, then was off and on for much of the trip. Fortunately although the higher elevations got an occasional dusting of snow, it stayed off the roads so I didn’t have any travel problems. The occasional rain did mean I often had overcast skies, which is what I want during the day for wildlife photography. The sun did shine inconveniently at times, such as when I was watching the large marmot colony at the end of the Summerland Trail in Mount Rainier NP or when I came across a bear on the Beaver Valley Trail in Olympic NP. I had overcast skies and rain when I came across this young bear on the Skyline Trail in Mount Rainier National Park, the most beautiful bear I’ve ever seen. Many of the pictures didn’t come out very well, the light was low and the rain sometimes heavy and my tripod was in my hotel room (intentionally, it was a long hike with a lot of elevation change). 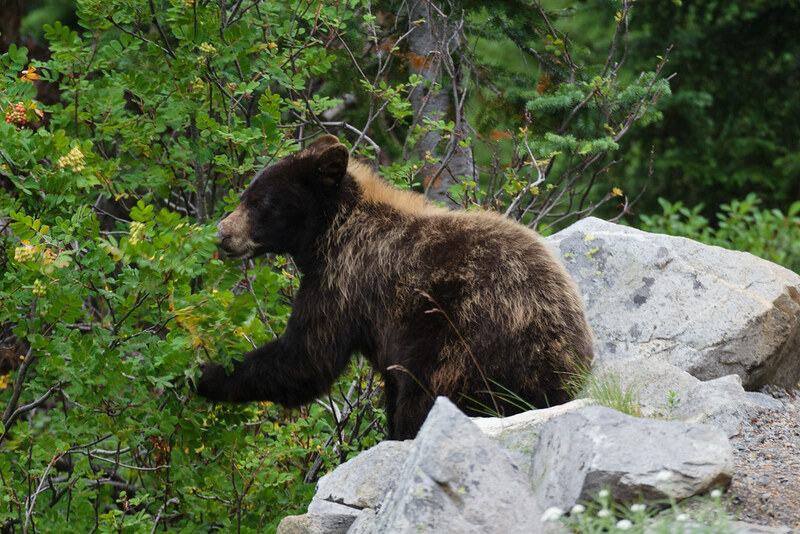 The bear was nose down in the huckleberry bushes and rarely raised its head, but it stopped to look at me once and you can see the seeds that have latched on to its head. And that was the best part of the timing of the trip, getting to watch a variety of animals preparing for the long winter. 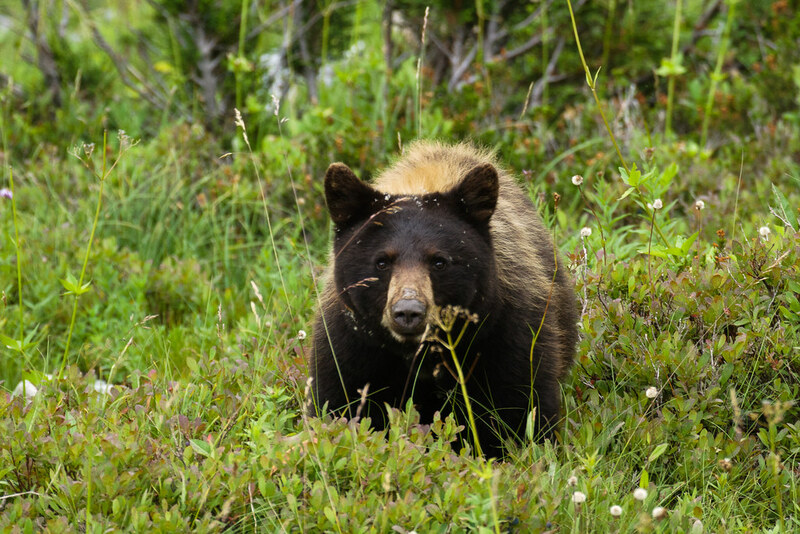 I doubt I would have seen so many bears if they weren’t fattening themselves on the huckleberries, and also I spent a lot of time watching marmots and pikas gathering food. 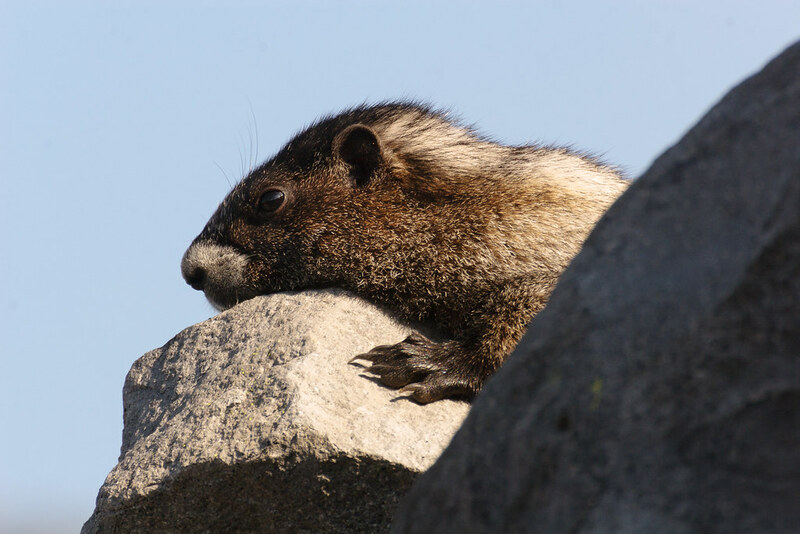 The marmots were putting on weight before hibernating for the winter, while the pikas (which don’t hibernate) were creating large stores of food above or under the rocks that they will feed on during the winter. So despite my early fears, my timing turned out to be perfect. When I think of bird feathers, I usually think of the large wing feathers. But birds have feathers of all sizes, and one of the fun things about close-up pictures like this is getting to see the individual feathers of all sizes. 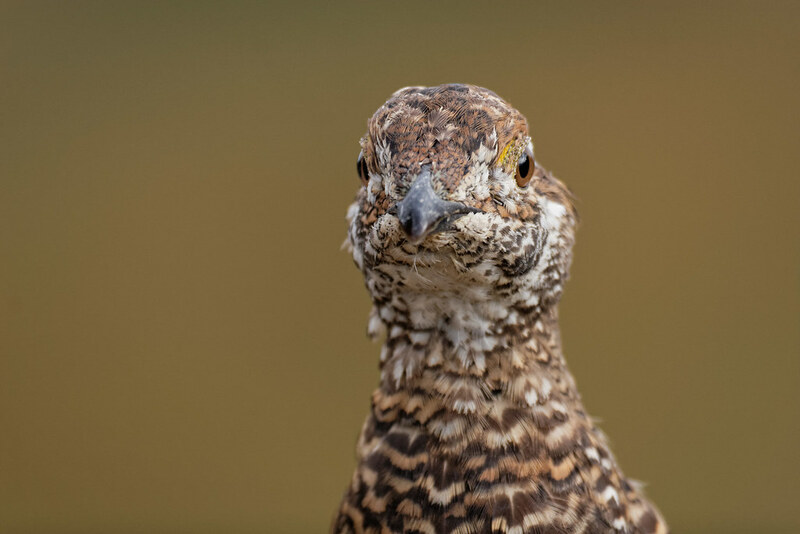 For example, although the eye ring of this sooty grouse looks like a solid band from a distance, up close you can see that it is actually a ring of tiny little feathers. Does This Picture Seem Familiar? If you’ve followed my blog for a while and have a photographic memory, this picture will seem a little familiar. It certainly seemed familiar to me when I took it. This view of a sooty grouse is very similar to a picture I took last year of a dusky grouse while in the Tetons. Not exactly the same of course, the head is turned at a different angle and the light and colors are different, but I certainly had the older picture in mind when I took this one. Sooty and dusky grouse used to be considered two races of one species, blue grouse, but were recently split into separate species. 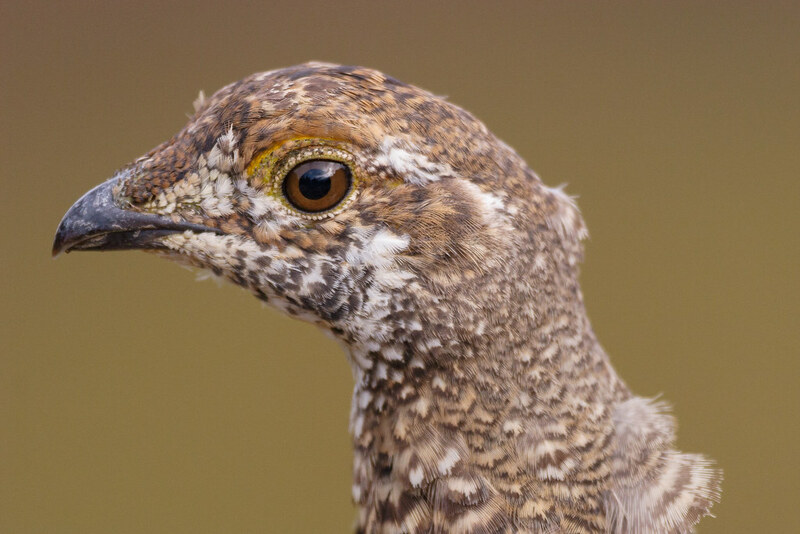 Here in the Northwest, the sooty grouse tend to be in the areas from the Cascades and west to the coast, while duskies tend to be in the eastern interior. This picture is from the Sourdough Ridge Trail in the Sunrise area of Mount Rainier National Park, the trail where I saw grouse the most often. I also saw them down by the Paradise Inn, and saw one in Olympic National Park at the end of my trip. That last encounter in the Olympics was the most like my experience with the grouse I photographed in the Tetons, I was driving out of the park when I saw one in the road in front of me. I stopped the car and turned on my hazard lights, as the bird was moving slowly and in no hurry to get out of the way. I got out of my car and encouraged it to hurry across the road, which is fortunate as a pickup came driving past right afterwards. That’s twice now I’ve played crossing guard for grouse.